Vomiting. Illustration of the human vomiting mechanism. An impulse from the brain (within triangle) stimulates the vomiting centre (red) in the brainstem. 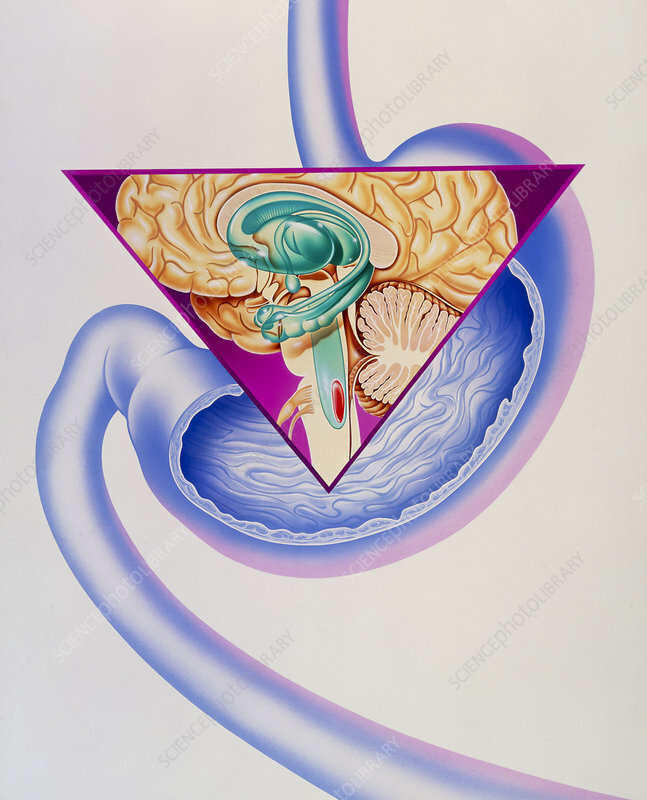 Nerve impulses sent to the stomach (blue organ), diaphragm and abdominal wall result in the forcible expulsion of the contents of the stomach. Vomiting can be triggered by overstimulation of or damage to the stomach, the balancing mechanism in the inner ear or the frontal lobes of the brain. Specific causes include hormonal changes during pregnancy, raised pressure in the skull caused by head injury or brain tumour, and overdrinking or eating.